Pandan coconut jam....now you are talking! :-) Just sensational! Yummy Koh, the final weight i got is about 500g, if just 3 of you, prepare half only or give some to your neighbour lor..
Angie, ya, this is yummy. the kaya look more nicer than those sell in supermarket and the most important is without artificial colour!!! Wow....such a beautiful kaya. Love the pictures. I miss kaya. I have to make too. Thanks for sharing. Just so good with toasted bread and coffee with condensed milk! Love the color and the flav of this kaya. Yummm. love it. YiYi, at first, I couldn't believe the colour turned out so green like jade!! Mary, yes, I like to have it with toast bread and a cup of black local coffee. Thanks, Sonia. Will find time to do it one day. Can you send some over? they look really good. haha.. I don't think I have patience to stand infront of the stove after the 2 hours experience of making pineapple jam. Anyhow, I'm sure the results are very satisfying, aren't they? cantik betul! I like it. I like the first photos , it turns out great ! The screwpine greens makes your kaya looks beautiful and it must be very delicious . Suhaina, thanks for stopping by. Yummy Koh, you are welcome. tracie, this one only need 1hour, look alright right, hehehe..
Jane, next round, I want to try your caramel kaya. Anh, Thanks for stopping by. Elin, nice one, quickly try out. J.O, then you must try this out. Wah, you had the heat on so high ah? I can see the bubbling bubbling.... My mom does her kaya for 5 hours and it can keep for a week w/o refrigeration and a year in the fridge. I like your pan you used to cook the kaya, looked like can hook to the main pot. Where did you get it? The kaya looks so nice feel like want to have a bread and spread the kaya immediately. After see this make me feel hungry. Thanks for sharing such nice recipe. Will try it this weekend. Wa...Looks good! Actually I wanted to make kaya long long time ago but keep making excuses and bought from the store instead. Probably its not my favourite so I just kind of lazy to try..hee hee..;p But I think I have to give it a go since its my family's favourite (definetely not me)..:) Thanks for sharing, Sonia. je suis malheureuse car je n'ai pas de pandan dans mon jardin. Wendy, 5 hours, dont think I can follow this way, this pandan kaya can keep at least 3 weeks in the fridge. I got the pan from Ikea. HS Kitchen and hobby,you are welcome. Reese, this recipe is simple and it taste yummy. hope you will like it. Zurin, so happy to see you dropping by my blog, I thought you have forgot me, hehehe..do try out this recipe, nice one. Mmm...I can smell the kaya already. Like the colour and the texture looks really smooth. Looks smooth and creamy! Yummy with thick toast and butter...so good! You made me want to make kaya again, hahaha! 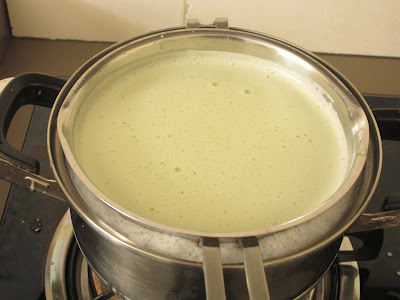 Wow this kaya method is very interesting , as few months I made kaya and it was really time consuming process this double boiling is really easy method surely will adopt this for next time.. I miss kaya after coming from singapore..
Looks so good and smooth and creamy; I have never had pandan leaves and now I want to try! It does look wonderful. 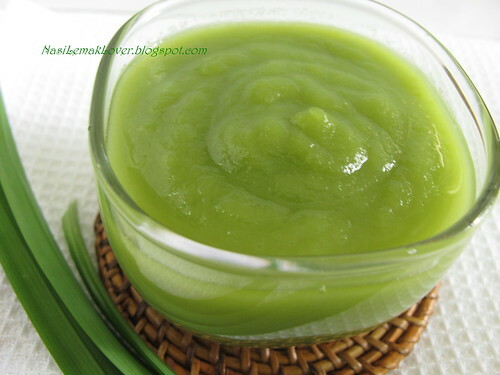 I can't find pandan, I would love to try this. I want to make the coconut spread, it's expensive in the market here. OOoh I would love to have some of that on my breakfast toast tomorrow. I used to help my mum make kaya when I was back in KL. But she'll make the brown version not green. Anyway home made version is so much more tastier than store bought ones. Kaya, my favorite bread spread! Your homemade kaya color is awesome! Anything homemade is better than store bought. I have yet to try this, but I would love it. Thank you for sharing. oh wow this looks great I want one of these plants! What a wickedly goodlooking fabulous jam it is. I dont know if i will get those leaves back here in the US. But what came out of it looks sooo good!Look at that color! Very nice colour! 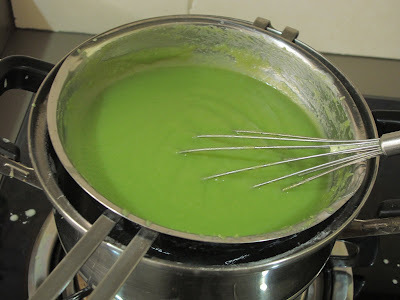 I made it once and it was tedious work 'cos have to stir all the time! Maybe I'll give your method a try. Thanks! So beautiful and vibrantly colored! Delicious! I loved kaya but very unhealthy though so I stopped making it. oh I must keep this recipe! It is good to have the smooth kaya that don't need to be stirred. wow, really good le, my mum always cook this too, but me very lazy...really very good, not too sweet. Gosh, your pics are so beautiful! Feel like digging my finger into the kaya right now! Anncoo, thanks for your lovely words. Lendanuar, Thanks for stopping by. Gertrude, then you should made the brown kaya. Bee Bee, Thanks for your lovely words. divya, in fact, it tasted wonderful. Rachana, Thanks for your lovely words. tasteofbeirut, hopefully you are able to get pandan leaves at your place, so you can try out. Mary and Lyndsey, I will learn another recipe without pandan leaves and share later, so you can try out. JO, next one i want to learn is the brown version too. Praniskitchen, Thanks for your cute lovely words..
A full time housefly, yes, you are right. Moon, once you finished the store bought one, next round try this out. Keats of sunshine girl, Thanks for stopping by. Colin, Thanks for your compliment on the photos. Lazora cooks, Thanks for stopping by. pigpigcorner, good not to have it too much..you are right. Sankyuta, Thanks for stopping by. Gulmohar, yes, fresh and organic. Cool lassie, next time I share with you the brown version without pandan leaves, so you can try out. Jeannie, yes, this method don't need to stir al the time. Cinnamon girl, Thanks for your lovely words. eskielover, Thanks for stopping by. Sze Sze, ask your mom to cook for you again, hehehe..
Cheah, Thanks for your lovely words. annann, Thanks for your lovely words. tigerfish, too bad huh, next round I share with you the brown version without using pandan leaves. Your kaya looks lovely! I like the green color too. No need to buy from supermarkets anymore! Hi, I'm back. I do love homemade kaya, healthier and more delicious. i love ur version of kaya's recipe, dun have to keep stirring to save ur work. Nice shot for the kaya!! What a brilliant colour! I want some with my toast! Hi Sonia, Do you use real coconut milk or packet coconut milk? 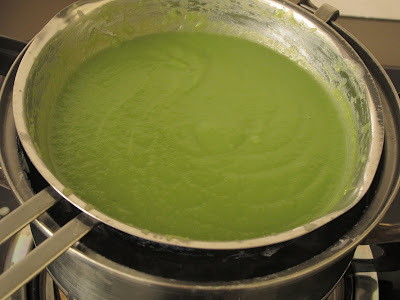 Ms B, I don't like the strong smell of pandan essence, anyway, will hop ove Lilyng's blog to check how she use microwave method.Thanks for sharing this info. homegirl, yes, I use real coconut milk, and prefer to use old coconut, better coconut aroma. Hope this helps. Amazing click nad colour looks awesome.I have never seen or cooked with pandan leaves will ggogle about them.I am not sure I can get them in UK. the color look great, It's taste better then commercial one,lol. Can we grown a pandan plant from fresh leaves. It very expensive a bag of pandan leave in north America, so I like to grown one? Kim, thanks for trying out. Don't think you can grow pandan just using the leaf. 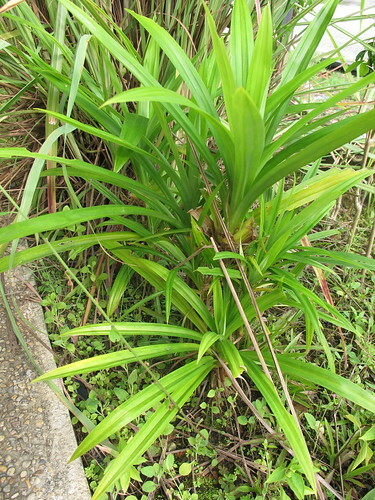 If possible, try to find the pandan come with root, then you can plant it . You really didn't stir it at all and the custard didn't curdle? The texture of your kaya looks beautiful. Shuyin, you must you fresh and slightly thick coconut milk for this recipe. Oh my god! I am so happy to have found this recipe... when visiting Melaka in 2005 I tasted Kaya and loved it, I bought so many jarsa nd took them with me in Europe. 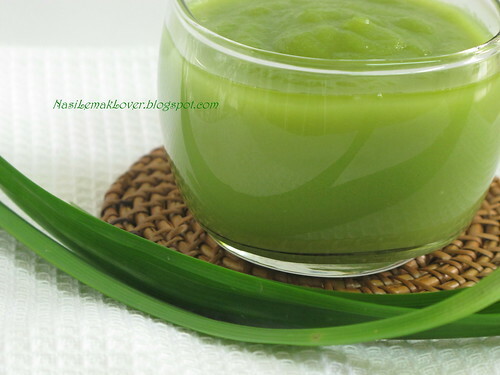 I would really like to trying making it... just have to find the pandan leaves! I tried the Recepi. It's delicious! I followed exactly the steps provided in your recipe but after one hour of cooking, my kaya did not get the smooth consistency like yours in the picture but became lumpy instead. Can you please advice what went wrong? Hi Corinna, sorry I missed out your question. Hi Amy and Corinna, I suppose you use double boiler method, make sure water is not boiling and not too hot, and remember to stir from time to time and stir in one same clock direction. 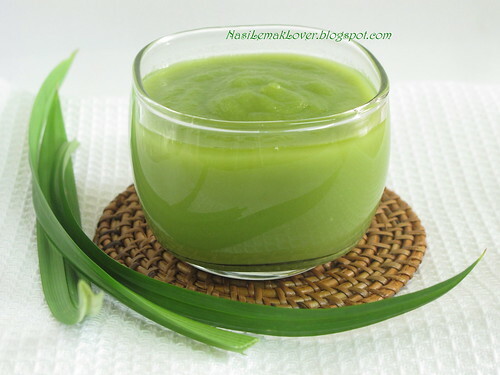 Peacebear, yes blend coconut with pandan leaves first then only strain the pulp and retain the liquid. Hi, Sonia! After cooked, my kaya became lumpy, totally not smooth and hv some water came out on the top surface. But the taste very delicious. I tried to blend after cooked but the result was too smooth & tasteless. I 100% follow yr method. Unfortunately, two times also failed. Really need your helps !!!!!! Thanks you so much. From: Ai Tin. 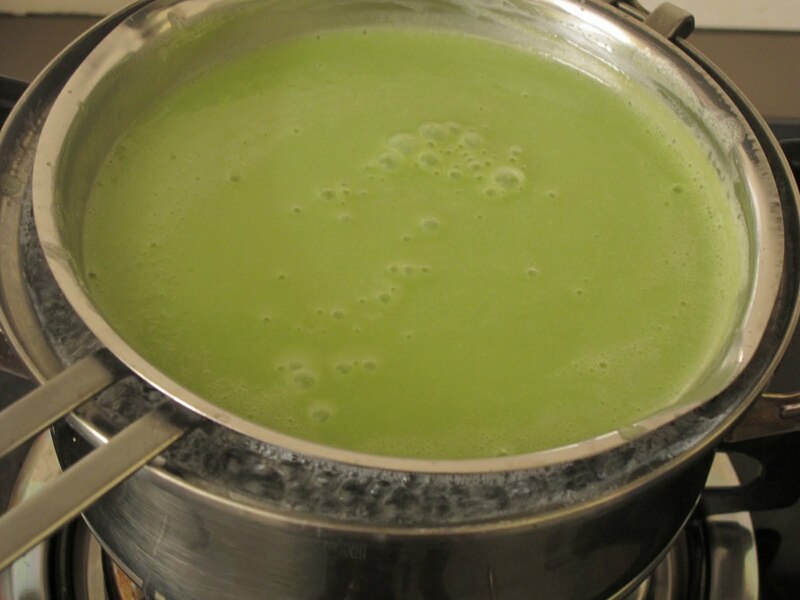 When making the double boiler, should the top bowl touch the boiling water or it doesn't matter? I did your Kaya.It turned out nicely. This is a keeper.Thank you so much. Thank you for sharing this lovely recipe!!! I tried it last week and it turns out delicious! I put only half of the sugar and it still a bit sweet, guess I am not used to food that are too sweet. I don't know how but my kaya turns out a bit lumpy. May I asked why after double boil the pandan kaya, there's water inside the kaya. I put a piece of cloth to cover the cover to avoid water from drippibg into the kaya. Even putting the kaya in the fridge, after a day or two, there's water in the kaya, can advise pls. hello, may I know have you tried to make kaya without pandan leaves? how's the taste? thanks.